Jimena is a PhD candidate at Lancaster University (United Kingdom) as part of the European Union ICE-ARC (Ice, Climate, Economics- Arctic, Research on Change) project. Her research focuses on assessing the role of integrated assessment models (IAM) as a tool to quantify the economic implications from Arctic change and to use the economic findings as a starting point for assessing policy options. She has 13 years of combined professional experience on climate change, sustainable development and economic & financial planning. After graduating as an Engineer, she worked for seven years on strategic and financial planning as part of the Techint Group. While working full-time, she was also a teaching assistant at the Instituto Tecnológico de Buenos Aires on two modules: “Simulation” and “Operations Research”. She was later invited to be a lecturer on the “Engineering and Climate Change” seminar and a member of the Commission on Environment and Sustainable Development of the Centre of Argentine Engineers. For the past 6 years she has been working on different research and consultancy initiatives with a focus on the socio- economic impacts resulting from climate change. 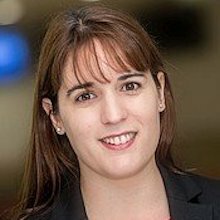 Jimena holds an MPhil in Engineering for Sustainable Development from the University of Cambridge and a BEng and MEng from the Instituto Tecnológico de Buenos Aires, Argentina. Her MEng thesis “Environmental impact of medium- sized cars using Life Cycle Assessment” analysed the impact of incorporating hybrid vehicles to the national fleet and was awarded the prize “Best thesis of the year”. She was awarded a Distinction for her thesis “Economics of climate change: the social cost of carbon from the RCP scenarios” from her MPhil degree. Integrated assessment models (IAM) as a tool to quantify the economic implications from Arctic change.